I think I’m slowly becoming addicted to cooking on my sheet pan. I just love how a dinner can come together in one pan and be really flavorful. And also be healthy too. Mexican food is one of my favorite types of food. Then again, I can’t think of any type of food that isn’t on my favorites list. Regardless, Mexican food is in my top 5 at least. Anyway, I was trying to think of any easy Mexican-style dinner that wasn’t tacos and can come together in a sheet pan. Fajitas came to mind and I’m so glad they did. These are so good! I always think about ordering fajitas when I go out to a restaurant and see them on the menu. But then I change my mind when I think of the sizzling, smoky pan coming to me and all the smoke aiming straight for my face. 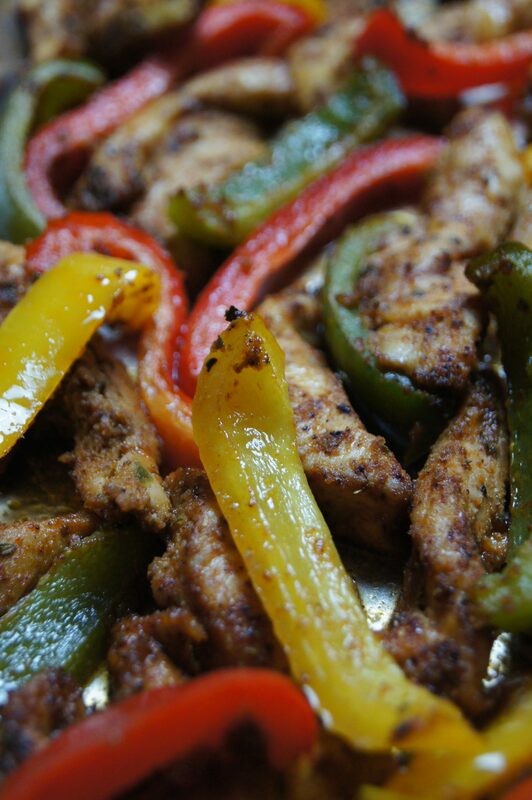 OK, I admit it: I had a fajita incident in the past. I was an awkward teenager, at an age too young to wear make-up, had a terrible perm, and wore glasses that were far from fashionable. (Oh, the humanity!) I was at an Uno’s and decided to be “different” and order the fajitas. (Can you tell I was a rebellious teen?) I could hear the sizzle a mile away and got a little excited. Then I saw the smoke and realized it was heading straight for me. The waiter put the sizzling pan in front of me and the smoke went directly to my face, instantly fogging up my glasses. The fogging stayed for what seemed like forever, though in reality it was probably only 30 seconds. I was so embarrassed – on top of being embarrassed by my bad perm. And when you’re a teenager, everything is embarrassing. To this day, even though I’m wearing contacts now, I still won’t order fajitas at any restaurant. I’m scarred for life. Actually, that’s not true. For me, enchiladas always beat out fajitas at a Mexican restaurant. And if I’m going to Uno’s I’m going for a deep dish pizza, especially since it’s been almost four years since I’ve had one. 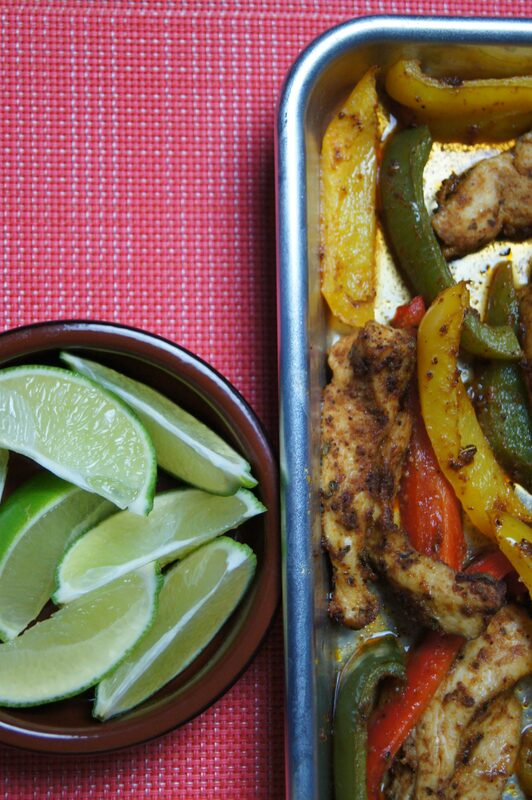 These chicken fajitas are so flavorful and easy to make. You can prepare them beforehand, and then just spread the chicken and peppers onto a sheet pan and pop it all in the oven. If the seasoning seems familiar, it’s because it’s the same spices that I used to make Chicken and Bacon Quesadillas . And while you’re waiting for the fajitas to cook, you can easily make Paleo Mexican Cauliflower Rice. 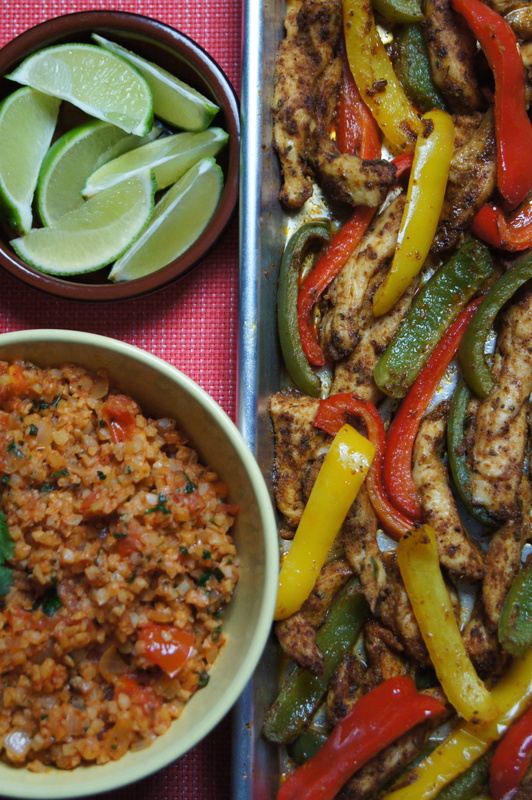 With everything prepped ahead of time, you’ll have a delicious fajita dinner in about 20-25 minutes. I think that’s pretty amazing and a great way to get over my awkward teen fajita episode. A salty margarita with these fajitas helps in my recovery too. In a large bowl, combine the ground cumin, chili powder, garlic powder, ground coriander, onion powder, smoked paprika, salt, and dried oregano. Mix the spices together. Pour the olive oil into the bowl and mix all the ingredients together. Add the chicken and peppers into the bowl and toss well, making sure the chicken and peppers are evenly covered with the spice mixture. 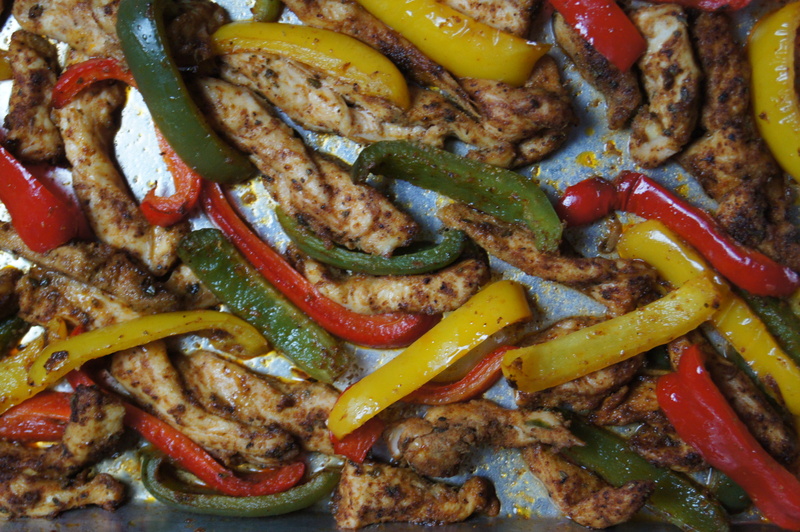 Lay the chicken and peppers on a baking sheet and spread evenly. Bake for 20-25 minutes, until chicken is cooked and peppers still have a bit of crunch to them. Serve with Paleo Mexican Cauliflower Rice (http://www.thetastypage.com/paleo-mexican-cauliflower-rice/) and/or tortillas, limes, sour cream, or avocado.